A new World Health Organization (WHO) report says that drowning remains a “neglected public health issue” that’s still happening with alarming frequency around the world and this news gets very little attention. So we have several factors that work in unison to stagnate any significant breakthroughs to reduce the overall number of drownings. Drowning is a neglected public health issue. Each year millions of dollars are spent to bring more people to water through beach restoration projects and open access projects. It’s estimated that a person drowns every 90 seconds in the world today. In the United States, 10 people drown each day. 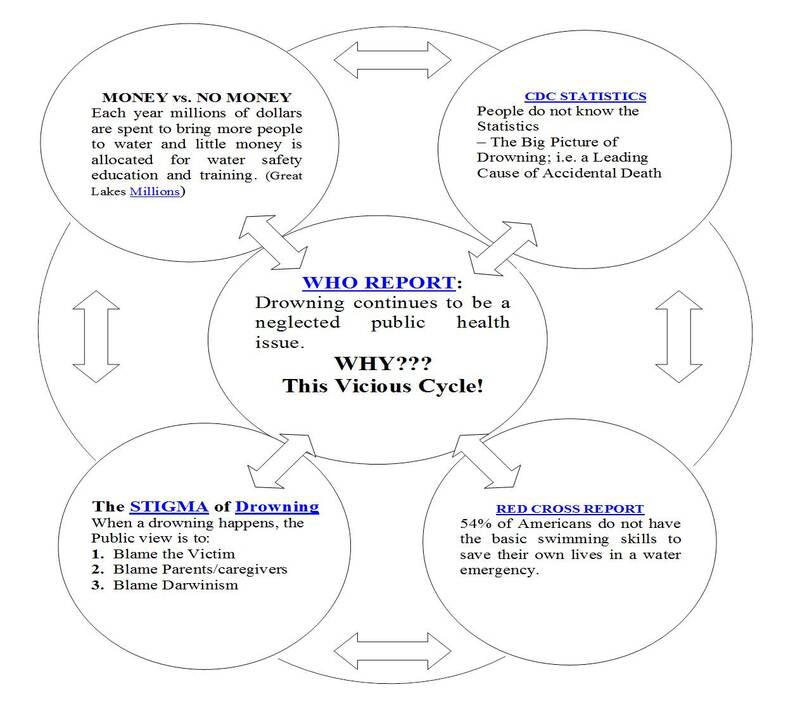 If the public is not educated about the statistics, then they do not know the epidemic number of drownings occurring and will easily support the Stigma of Drowning. People who do not have the basic swimming ability to save their own lives in a water emergency (Red Cross Report) nor the swimming skills, swimming endurance, rescue training, and first aid and CPR skills to save a life; i.e. ‘would-be’ rescuers often become drowning victims attempting rescues. People who unknowingly support the Stigma of Drowning (i.e. 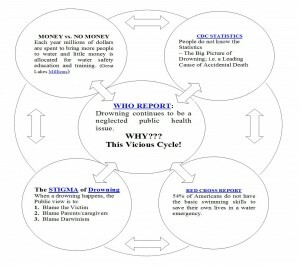 Blame the Victim, Blame the parents or caregivers, or Blame it on Darwinism). People who support the Stigma have a false sense of security that “Drowning can’t happen to me because I know how to swim, I wouldn’t be that stupid; i.e. drowning only happens to stupid people, etc. Little money is allocated for water safety education and training. Drowning continues to be a neglected public health issue. Millions continue to be spent each year bringing more people to water. The Great Lakes Surf Rescue Project (www.GLSRP.org) is pushing for a Water Safety School Curriculum to launch in the Great Lakes Region and then become a nationwide mode. The GLSRP has taught over 139 Great Lakes Water Safety classes in 7 of the 8 Great Lakes states (WI, IL, IN, MI, OH, MN and PA ). The GLSRP has a comprehensive curriculum, but lacks funding to convert its curriculum into coloring booklets, training booklets, animation, and videos (Crowdrise Fundraiser).